I thought I’d get into the spirit of the season with some Halloween books since I haven’t done a booklist in a while. My booklists are no longer as comprehensively long as when I worked at the public library, but judging by my books read count so far this year (down 137 books from 2008 right now) this is because I have less time to read than in the past. But I make up for it with class activities (I hope). 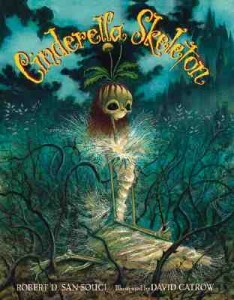 Cinderella Skeleton by Robert D. San Souci. This is my favorite Halloween book, hands down. San Souci is definitely no stranger to fairy tale adaptations and scary stories, and this one doesn’t disappoint. Our Cinderella is the most beautiful corpse in the graveyard: perfectly green teeth, perfectly ghastly complexion. She makes all the other skeletons jealous. The story follows all the familiar elements of Cinderella we all know and love: evil stepsisters and stepmother, a ball (in this case a spooky Halloween ball), a prince, and a shoe. But in this story Cinderella leaves her whole foot behind, still in the show. This is a story that manages to be creepy, haunting, beautiful, and charming all at the same time. We still want Cinderella to find her boney prince in the end, even if happily ever after is more cobwebs than tiaras. 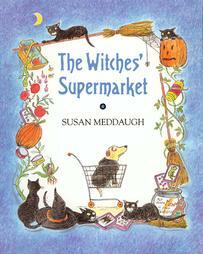 The Witches’ Supermarket by Susan Meddaugh. This is an incredibly fun imagining of witches among us. It’s Halloween, and Helen dresses up as a witch. Her dog Martha is unhappy to be dressed as a cat, but everyone knows witches only have cats as pets. While trick or treating they see a woman drop something and follow her down a dark alley to return it. Instead they find a fun and creepy supermarket just for witches (selling worm, snakes, brooms…you get the idea). This is a really original addition to a genre full of mediocre titles. 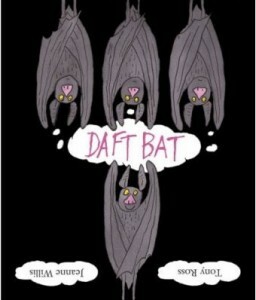 Daft Bat by Jeanne Willis. This isn’t specifically a Halloween story, but it is a great bat story. And when’s a better time to read about bats than Halloween? All the wild animals think our little bat heroine is crazy (“daft”) because she sees the world from an upside down perspective. To her, the sky is below her and the ground is above. The other animals tease her for her different world view, but in the end all those around her learn a big lesson in tolerance when they try out her point of view for a change. It’s a great message for kids and a light change of pace if you’re getting Halloweened out this month. Ghosts in the House! by Kazuno Kahara. 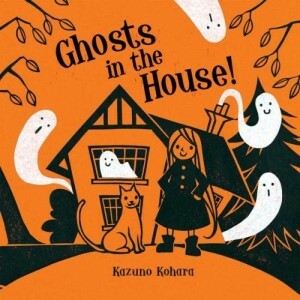 Our clever heroine lives in a haunted house. But lucky for us she happens to be a witch and knows exactly what to do with ghosts. She washes them, airs them out to dry, and turns them into slipcovers for her couch, sheets, etc. The illustrations are incredible, and the story is great for very young kids. It’s a story about ghosts and witches that manages to steer clear of scary nightmare material. The big selling point of this title is by far the illustrations. The story doesn’t beg to be read over and over again, but it is still a beautiful addition to the list. Boogie Knights by Lisa Wheeler. 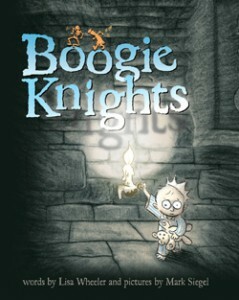 The title may be a pun off something scandalous for children, but the book is great fun for munchkins. There is tons to look at here with Mark Siegel’s modern illustrations, and the story is a great one for young children. It’s just scary enough, and everything to be feared is revealed as not very scary after all in the end. All the monsters have come to the castle for the Madcap Monster Ball. The ghostly suits of armor are supposed to stand guard and keep out this riff raff, but they are fast asleep. One by one they wake up, follow the noise, and end up joining in the party. The young prince awakens to all the scary noise from the party and goes creeping through the castle until he finds the party. And the story ends with everyone happily tucked back in for the night. Great Halloween fun.